"Foster program could help make puppies good pets"
These three puppies are some of many available for adoption through the Navajo Nation Puppy Adoption program. This story was published in the Gallup Independent daily news, January 20, 2011. Window Rock — Dogs are everywhere on the Navajo Nation. Some run in packs, others scrounge for scraps at the grocery store and few play in their owner's yard but the latter unfortunately is not as common. The Window Rock Veterinary Clinic is looking to change that with a puppy fostering and adoption program. "When people from the outside look in and talk about how great the Navajo Nation is, they also always note the dog problem," Kendra Wapaha, community outreach coordinator for the clinic, said. The program gives people all the tools necessary to provide a home for a puppy until it has reached adoption age, including food, blankets, collars, tags and veterinary care. Since its inception in 1995, and with the help of programs and associations such as the International Fund for Animal Welfare, the Navajo Animal Control Service, and National Relief Charities, the fostering program has been able to provide homes for hundreds, if not thousands, of dogs. 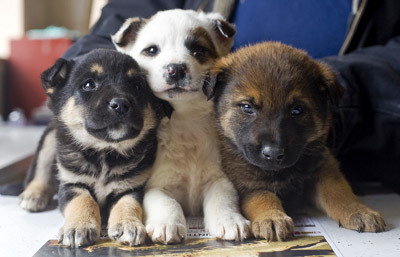 Three precocious puppies wandered around an enclosed corral in the clinic's back room. A white fluffy one climbed over its brown roommate to try and reach the corral's door. The black puppy with brown markings watched them with his head bent curiously. Because of the high parvo risk, the puppies have to be on concrete floor and can't be in close proximity of the clinic staff because of their constant contact with sick dogs. "We're not allowed to hold them too much because we're a clinic, not a shelter," Wapaha said. The lack of interaction with anyone else could be detrimental to their growth. The socialization period is important in a puppy's life and teaches it to be a well-adjusted companion or watch dog. Cathleen McKinley, of Fort Defiance, stopped by the clinic Wednesday morning to enroll 11 puppies into the program. Seven of them were from her dog's litter and four were strays. "People offered to pick them up and I only wanted to give them to people who would take care of them," McKinley said. When no one called back to arrange a pick up, McKinley went to the clinic. Wapaha and the staff provided her with everything to help her care for them and scheduled an appointment to get her dog spayed. Tucked in to the back of McKinley's SUV, the puppies nestled and cuddled with each other, seemingly peaceful, knowing they were going home. "I just don't want to see them anywhere but here," McKinley said. "Dog owners can bring in their own puppies as well as strays and enroll them in the program," Wapaha said. It's a humane alternative to dumping them off in the middle of nowhere without food or proper care. "People should foster their own puppies, they're their responsibility," she said. Information: Window Rock Veterinary Clinic, (928) 871-6615 or visit the clinic next to Nakai Hall.